This week employees of Thomas Cook Travel Agency helped fill KKIS bags with school supplies. Their benevolent arm, Thomas Cook Children’s Charity, granted money for KKIS to buy school supplies this year. Some volunteers spent time in KKIS office back room putting pencils and pens into pencil cases while others stacked plastic boxes that had been gathered for transporting filled bags. They were joined in service by KKIS high school scholarship students. KKIS (Keeping Kids in School) Bag Packing has Begun! 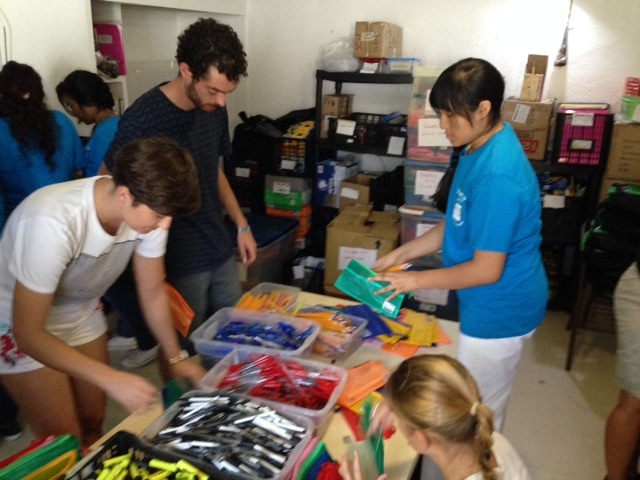 Monday KKIS volunteers began packing pencil cases with school supplies for the children of Playa del Carmen. Several of the KKIS high school scholarship students joined us, as did employees of Thomas Cook. They were energetic and managed to pack almost 2,000 pencil cases in one day! The Thomas Cook Children’s Charity gave KKIS a grant earlier this year that will provide school supplies for every child in two schools located in the Nicte Ha neighborhood. 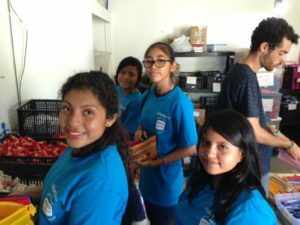 Packing will continue everyday for the next two weeks and culminate in delivery to six schools, almost 3,000 students, the week of Aug. 22 – 25. Thomas Cook volunteers in new KKIS the shirts. Thomas Cook Children’s Charity Grant Received!!!! Last Fall we were contacted by the local director of the Thomas Cook Travel Agency here in Playa about their agency’s charity, Thomas Cook Children’s Charity, and encouraged to apply. So we did. Our request was for sufficient funds to buy school supplies for 700 students that we would deliver, with the help of their employees, to children the first week of school in August, 2017. This week the KKIS Project heard that the grant has been awarded! 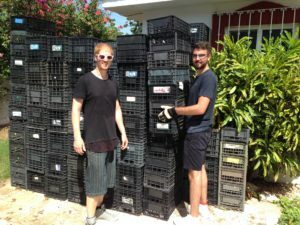 This will allow us to help more kids stay in school in Playa. Thanks Thomas Cook Children’s Charity.